Key check no. 2: Sow recommended varieties of certified seed. A "key check" seems to imply that this step should be one of the top ten most important steps to getting it right and getting a good crop. But no one else in the group is taking this one seriously, it seems. Why is it supposed to be important to use certified seed? The main reasons listed in various documents linked to the Rice KnowledgeBank are: varietal purity, freedom from insect damage and disease, high viability, freedom from weed seeds. Certified seed, by definition, maintains at least at minimum quality standard in these areas. The default among IRRI agronomy-types (and RiceSurvivor participants) is to get seed from a previous field experiments, from another agronomist's field experiment, or from a friendly plant breeder (this last option is a distant third, because breeders aren't usually interested in released varieties). I believe this default option to be similar to a farmer using seed produced on her own farm during the previous season, which is exactly contrary to the official "key check" recommendation. Producing certified seeds includes the following steps: 1) starting with some level of high-quality seed (e.g. breeder's seed, foundation seed, registered seed, or certified seed); 2) growing it well; 3) "roguing" it at least twice (flowering, harvest) to eliminate off-type plants; 4) harvesting and threshing with unusual care taken regarding moisture content and the time of each operation and with appropriate threshing technique; 5) thorough cleaning to remove chaff, straw, empty grains, weed seeds, dirt; 6) immediate drying and appropriate storage. I guess that a typical IRRI agronomy experiment would usually include steps 2 and 5, would sometimes include optimum conditions in step 4 and 6, and would not usually include steps 1 and 3. We obtained "registered seed" from PhilRice. I don't know where the other teams ended up getting their seed. I suggest that we all do quick checks of seed quality to get an initial idea of how different our seed sources are. I will make a seed quality survey sheet for each group. In the short term (i.e. two weeks), maybe we will find that our seed quality is independent of seed source. Maybe not. In the longer term (i.e. 4 months), maybe we will decide that all of our seed quality was "good enough", and that the many other management decisions were more important than this one. Maybe not. It sounds like a Yogi Berra quote, I'm just not sure, but somewhere along the way I heard: "In theory, there is no difference between theory and practice. But, in practice, there is." It's what bounced across my mind as the Rice Survivors made their way across their overgrown fields for the first time. The pictures above are pictures from our field (826) taken yesterday afternoon (14 Dec. 2012). After James Quilty alerted me that our plot (826) is being irrigated, but only half of it, we suddenly rushed and visit the field. Surprisingly, it seems to be a sabotage from group 2 (plot 825). As Sarah mentioned in her blog, we just want our plot to be dry tilled for faster decomposition of biomass left in the field. Although, wetting of the half our plot will not hurt us too much instead we will use it as a comparison to the other half of the plot which will be total aerobic decomposition. I suppose this is not intentional mistake ;) but hopefully next time, if the group has a certain activities even though it is just a simple land soaking operation like this, I suggest that at least one member of the group should be present specially at the start of the operation. This is a picture of our plot being plowed yesterday. 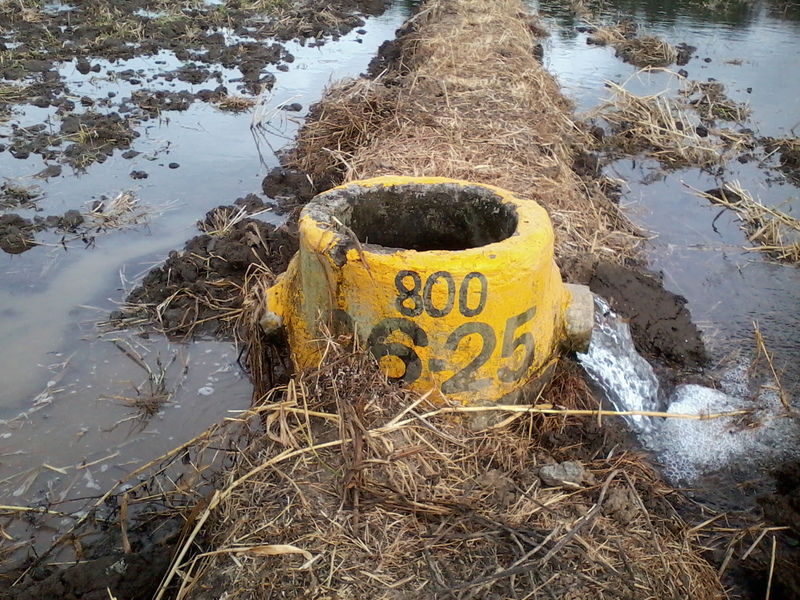 The tractor operator had some difficulties in maneuvering the disc plow because of the bund in the middle of our plot. At first, I'm a bit hesitant in retaining the bund since it will not maximize our planting area as well as the cost involved in repairing it. However, I agree with my teammates that the bund can make our field operations (e.g., fertilizer application, disease detection) easier. 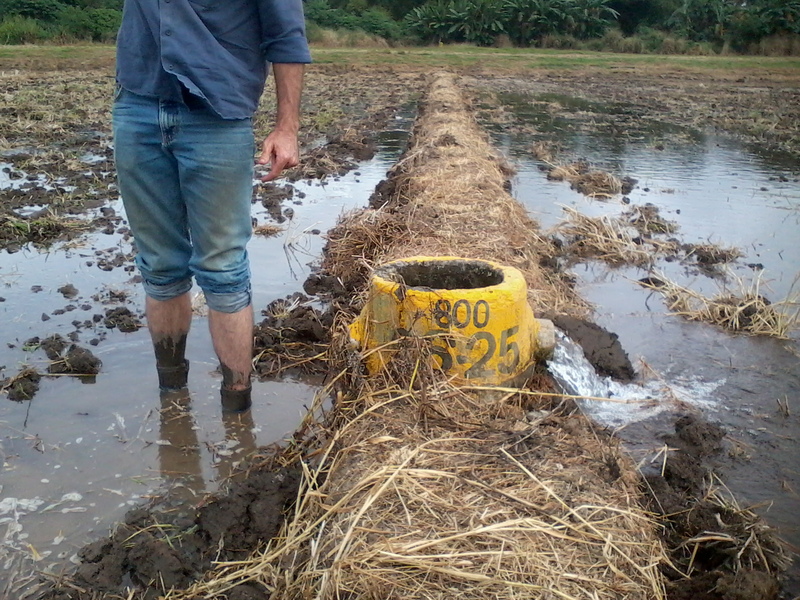 Also, we are planting two rice varieties and the soil below the bund might not be suitable for rice planting. Some participants and ES staff advised us to remove the bund but we will stick to our decision. I was asked by Michael Joyce for an interview to share some of my thoughts and feelings about our first meeting. Before Michael came to my office I just typed the answers to his questions. Katie and Nicola requested me to share it with everyone so here it is. Michael: What are your thoughts on the first meeting? Weng: On the first meeting I was both excited and anxious. Excited because, I will meet the other participants who are eager to learn like me. I know most of them by face but I haven't interacted with them personally including Katie and Nicola to whom I was exchanging emails about the activity. The discussion on choosing the criteria for judging who will be the best team is mind stimulating. Finally 3 points came out. They were 1) profitability 2) environmental impact and 3) comfortability. In the course of the discussion, people smiled when Noel suggested that instead of competing with one another the entire rice survivors can help one another in decision making and compete with Achim instead. When each group was asked to convene I was very very uncomfortable, because we were only three in the group and the three of us (Alex Grondin of Physiology Group, Judith dela Torre of Nutrient Manager Team, and I, an 80% laboratory person, who didn’t have real experience in the field. When we were asked to plan on what variety to choose, what sowing method we like, and land preparation to make, fertilizer, weed mgt, pest mgt…..I felt totally lost because I have no experience in it. Anyhow, I was relieved when Bhagirath, the IRS member of our group, came. Bhagirath suggested that Team 4 can go for dry seed method. Bhagirath is an advocate of of this method and a mechanization supporter because he said it is the future. James Quilty, a post doc in Soil Science, also a team member of our group but was not there on our first meeting due to some field work assignment, shared the same advocacy. Each team of the four teams made their decision as to what land preparation and sowing method to choose. The other three teams will go for transplanting while our group is the only one who will go for dry seeding. When Leigh came towards the end of the session because of a commitment in the field, he informed everyone of the situation of the area (824-827) that we are going to use. He said that the outer drainage system of the field is okay but the internal drainage of the field is not quite good- a word of caution particularly for us who will go for dry seed method. Initially, I was personally not comfortable with the decision our group to go for dry seeding because of the fact mentioned by Leigh and because of some expectations I had before joining the Rice Survivor Challenge. When I joined the challenge all I had in my mind is the transplanting method. I said “Wow Im gonna learn how to make seed bed, Im gonna learn how to do the actual transplanting in the field…and so on and so forth”. I was initially dismayed, because what our team will do is entirely different to what I expected. Anyhow, my views changed when I learned the overall goal of this challenge. I learned that after this challenge and several trials perhaps, IRRI will make a clear guideline on how to produce rice in the field which can be given to farmers. Nicola and Katie said that IRRI have this guideline but it is not up to date and not being used. So we we are the guinea pigs for making this new guideline based on the latest knowledge and technology. So upon learning this, I realized that it would then be good to have a variety of set up which everyone can learn from. If a guideline will be made out of this activity then it will be like hitting two birds in one shot and its benificial for IRRI. 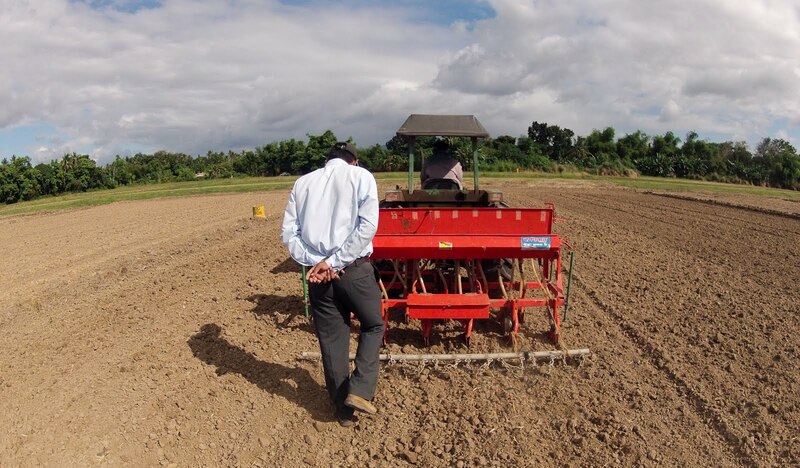 In reality, not all farmers would like to go for transplanting method some farmers would like to go also for dry seeding depending on the condition of their field. Also, not all farmers would like to do the manual transplanting because of the rising cost of labor at some point they will be investing on machinery for the mechanization of their field. So with our Team going for mechanized dry seeding and the rest of the three teams going for transplanting- two benificial information can then be generated instead of us all doing the same method. 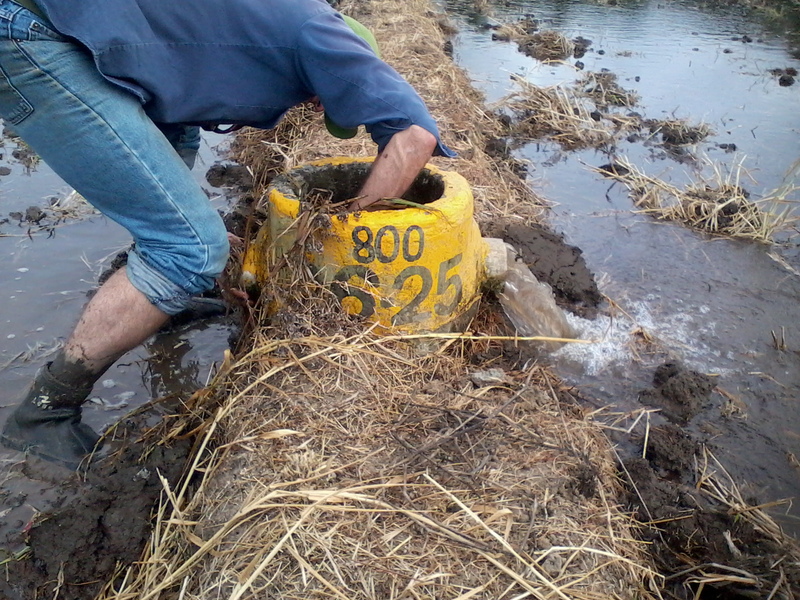 We finalized our decision on land preparation, when we go out in the field yesterday. Bhagirath, made an arrangement that all of us go there and have our meeting since he was not there on our first field trip in the morning of Wednesday, Dec 5 because of workshop in dry seeding. James made the detailed step by step field operation procedure, and the two explained to me and Jec (Judith) some of the field operation terms that we didn’t understand. Yesterday, I’m so happy. I felt the team was so solid. Michael: What are the keys to succes for your team? Weng: Team spirit, open communication and helping hand. I think those are the some of the keys. Michael: What is the role of failure? Weng: I think failure in itself is not bad. Failure goes hand in hand with success. How? Failure makes an individual stronger. It makes us to rethink and reevaluate the decision we made. It hones our personality as well for us to improve and persevere more. In this kind of challenge, decision making is very important. Even if we fail, if we use it as a stepping stone to learn, we can then finally make the right decision to succeed. And we can then say we survived the challenge. We are Survivor! 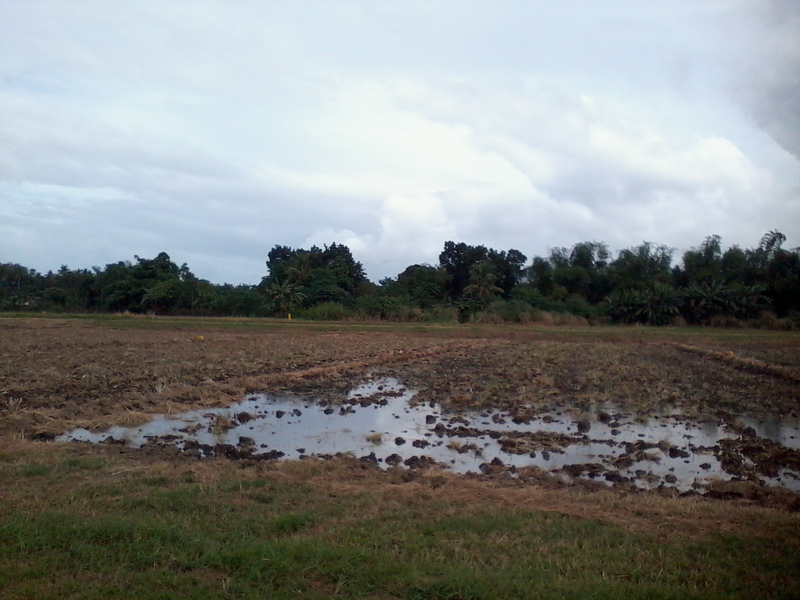 Intentional destruction of soil structure by doing tillage under floodwater, which squeezes air out of pore spaces, breaks clods, and forms a hard pan. To make it easier to maintain 5-cm depth of water over the field during most of the season, which improves weed control (because many weeds don't survive the anaerobic soil environment) and enables optimal nutrient availability in most soils (pH goes towards neutral, at which most nutrients are relatively available). a) How many field operations after land has been soaked? b) What equipment for first (deep) plowing? 4-wheel tractor with disc configured for "plowing"
4-wheel tractor with disc configured for "harrowing"
d) What equipment for leveling? Although we have decided to do "puddling", all of these decisions are yet to be made. The field operation we did today (aerobic disk plowing with 4-wheel tractor) is considered a fallow management operation (rather than a land preparation operation that is part of the true "puddling" process). We visited the machine shed today and got a brief tour of the options. Our team has decided we want to do as many field operations ourselves as possible, which demotes the 4-wheel tractor and carabao options to the bottom of the list (since none of us can drive a tractor, or knows a particular carabao well enough to get it to cooperate). We believe ourselves to be capable of pushing a 2-wheel tractor, primarily based on the information that some of us did it once for a few meters during a CESD event. If any of my readers would like to help clarify the options or implement names in my lists above, please help! Confucius said we gain wisdom in one of three ways: First, by reflection, which is noblest; Second, by imitation, which is easiest; and third by experience, which is the bitterest. I agree with the imitation bit. However, I'd like to think we do best of all when we combine the other two and truly reflect on our experience. And perhaps that is what Rice Survivor and this blog is all about. And it is why I admire the Rice Survivors. They are willing to risk embarrassment, failure, and even success in the spirit of learning. I'm grateful to each of them for letting me listen in and record their journey. The journey begins, oddly enough, in a conference room where they meet for the first time and try to decide just how they will measure what counts as survival. 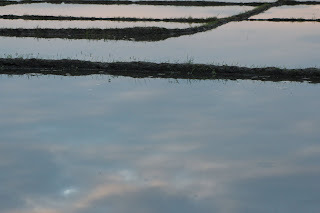 This begins a new experience for me of blogging and growing rice. It was great to be out in the field this morning smelling the freshly tilled soil and listening to the tractor circle the small plots. Today's field activity will be the only one resembling what I grew up doing on my family's corn and soybean farm. I'm anxious to put seed in the ground but we still have a couple weeks of field preparation to do. Our team will do traditional manual transplanting so we can gain experience in the traditional establishment method. We plan to establish our reduced-area wet bed nursery on the Thursday before break and then do our transplanting on the 2nd week of January when all our team is back and available to stick seedlings in the ground. nice to see everyone so enthusiastic in the field yesterday. Katie and I have been copied into the first operational request to the IRRI farm that one team sent out today. I'd like to share their idea with you of letting Bert or Roly know the contact details of your groups relevant activity leader (cell phone works probably best) so that they can notify you when an operation is going to happen in your plot. That way you get a chance to participate in or check out the operations in your plot even if it's outside our scheduled field visits. On another note, don't be afraid to nominate an activity leader who may not be an expert on the topic or put your hand up to be one even if you think you have no prior knoweldge of the activity. It's a learning process for all of us and your team will help to find and provide the relevant knowledge to make decisions. Rice Survivor is a challenge to put rice scientists to the test! Four teams comprised of staff and scholars from the International Rice Research Institute will compete against each other to see who can grow the best rice crop. This is a hands-on learning experience to get people out from behind their desks and computers and into the field, knee deep in mud. There are NO powerpoints allowed in this classroom! The purpose of this new method of training is twofold. 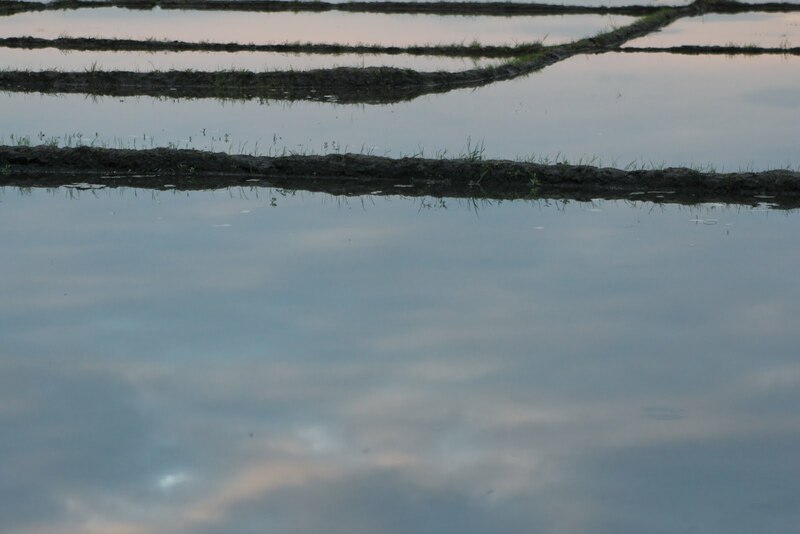 First, we think it's important that the staff of an international rice institute understands the entire rice production process and the decisions and challenges that farmers face. Second, it helps us as an institution to identify the gaps in our knowledge resources and what we can do to fix it. Each team is made up of 5 members that come from different professional backgrounds. Teams are a mix of nationalities and experience levels and the majority of Rice Survivors have very limited experience in growing a rice crop. The challenge will be evaluated based on which team can most efficiently produce rice. We will be judging based on the profitability, sustainability, and comfortability in producing rice. MAY THE BEST TEAM WIN!! LET THE GAMES BEGIN! !